This post explores and reviews one of the most revolutionary product-manufacturers in cannabis — Mary’s Medicinals, a company that has pioneered a new form of cannabis consumption. As you’re probably aware, there are almost as many ways to ingest medical cannabis as there are reasons for ingesting it. But you may not realize there are new cannabis products you put ON your body instead of IN your body, and these delivery methods are making the whole industry take notice. Do Mary's Medicinals Transdermal Patches Work? How Do Transdermal Products Compare to Other Cannabis Medications? Starting in 2013, Colorado-based Mary’s Medicinals, a company dedicated to advancing medical marijuana technology, began distributing transdermal patches and topical gel pens that are carefully dosed, beautifully packaged, and highly effective. Today, the entire line of Mary’s Medicinals cannabis products are finally available wherever marijuana is sold legally. Thanks to great cannabis delivery services like Nugg, your THC-infused patch is just a few taps or clicks away! The best part about Mary’s revolutionary new way to administer marijuana is the head-spinning array of choices. If we’re just talking about transdermal patches (don’t worry, I’ll get to the other exciting products shortly), you can get the 2 “x2” medicated patch in the following varieties: 10mg of CBD , CBN , THC or CBD/THC; and 20mg of indica or sativa. We put Mary’s new medicated patches to the test below, but first we’ll look at the history of the patch itself. After all, transdermal patches are nothing new. You probably know of nicotine patches used for smoking cessation, but did you realize that transdermal patches have been around since 1979, when the FDA first approved them for administering the drug scopolamine to combat motion sickness? Since then, the patch has delivered everything from birth control to vitamin B12. In many ways, a medicated adhesive patch is the ideal way to ingest cannabis. Most importantly, it releases the cannabinoids in a constant, controlled manner. This time-release property is a perfect complement to the medicine’s analgesic effects, and it may be the most convenient way to take your medication ever – stick one and done. 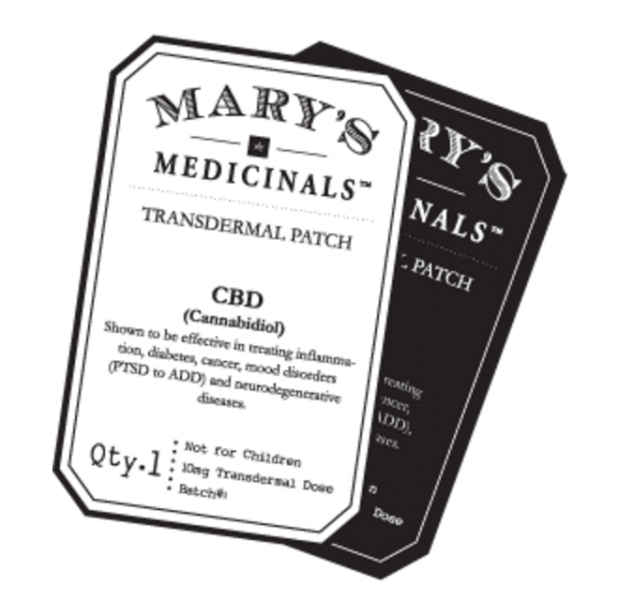 Do Mary’s Medicinals Transdermal Patches Work? In a word, yes. You will start feeling the effects about 25 minutes after you slap it on. The effects are quite subtle at first, but also very enduring – not 8 to 10 hours like Mary’s website claims, but a solid 4 to 6 hours of extended relief. The THC “high” is as potent as a double-dose cannabutter edible, but lasts longer, and the CBD pain-relieving properties are out of this world. Mary’s most popular cannabis patches, and the only ones we tested, were the 10 mg. CBD/THC combination patches with a 1:1 ratio, and the 20 mg. THC Sativa patches. They cost about $10 apiece, less in multipacks. The most remarkable effect noticed by everyone in our diverse sample, is the analgesic effect of transdermal CBD on old, forgotten aches and pains you’ve simply accepted and learned to live with. Several of our test patients, who suffer from different ailments helped by cannabis, were surprised to experience an absence of discomfort in joints and muscles that were normally a problem, including this writer! Both a nagging ache in my shoulder, and a lifelong knee pain simply disappeared. I had suffered for years, and gotten used to the soreness, so it was a pleasant surprise to get some relief I didn’t bargain for. These effects wear off about 4 or 5 hours after applying the patch, but you can then light up a bowl and keep the medicine flowing. Seriously, a joint or a vape pen hit are exquisite after your patch starts to wear off. The 20 mg. THC patch was designed primarily for recreational users, and it will keep you comfortably medicated for half the day. Our test of the Sativa patch proved to be the perfect focus for daytime use, more of a natural pick-me-up – Mary’s non-drowsy formula, if you will. As expected, a few of our patients inquired about using multiple patches at the same time. According to Mary’s Medicinals’ Chief Scientist Noel Palmer, multiple patches can be applied, including mixing and matching the different types. In fact, Palmer recommends two patches for regular cannabis users or large body types. You can’t O.D. on cannabis, but applying more than two patches is downright wasteful, not to mention expensive. If you prefer uninterrupted low-dosage relief, says Palmer, feel free to cut each patch into four pieces, and apply one quarter at a time. The patch should be applied anywhere on your body where you see veins below the skin – wrists, ankles, or the top of your foot. They are not any more uncomfortable to remove than a Band-Aid, but if that thought makes you queasy, soak the patch in warm water before removing. Remove any residual adhesive with rubbing alcohol. While this proprietary line of medicinal patches is spreading quickly through the cannabis community, and putting Mary’s Medicinals on the map, the company has a number of equally revolutionary products on the market. Transdermal Gel Pen – The Transdermal Pen is like the patch, except you squeeze out 2 mg of either CBD, CBN, THC Sativa or THC Indica gel, which is rubbed into the skin to ease soreness and relieve pain. 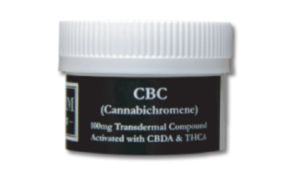 Transdermal Topical Compound – an all-natural analgesic cream containing 100 mg of active cannabinoids, including CBN and THC, which is reported to be the balm-dot-com for stiff muscles and inflammation. 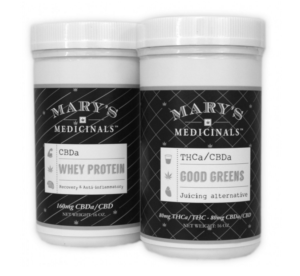 Cannabinoid Green & Protein Powder Mixes – Mary’s has found a method of encapsulating fresh plant material that retains the nutritional value and active cannabinoids, available in powder form mixed with either whey powder or greens. Maybe the perfect product for those who love combining cannabis with their exercise and workout routines? Elite CBD Muscle Freeze – This is Mary’s newest product, a combination of CBD and natural plant extracts for a soothing and cooling cream that eases sore muscles and provides a warm glow you’ll never get with Ben-Gay. 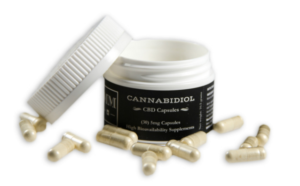 CBD/CBN Capsules – Mary’s capsules are 100 percent plant-based, vegan, GMO-free, gluten-free and contain no additives or organic volatile impurities. Each container contains 30 5mg. CBD/CBN capsules that are 100% non-psychoactive, meaning they’re intended strictly for medical use and their pain relieving properties. We did not try the gel pen (or other products for that matter, but we will), but noted that it’s a sophisticated instrument for exact dosing and includes a child-safety feature. Simply rotate the top portion of the pen clockwise to unlock the child safety mechanism, and back the other direction to lock it after dispensing. To dispense, push down on the top of the pen – the tip will dispense 2mg of gel per click – rub this into a veinous area such as your wrist. If you’re at all curious about exploring these products in more-depth, you should definitely check out the Mary’s Medicinals website, where you can see how the founders are dedicated to natural pain-killing techniques and cutting-edge cannabis medicine. Their slogan, “For us, it’s simply black and white” is reflected in their simple philosophy and in their elegant, old-timey black and white web pages that hark back to 100 years ago. And if you’re looking to buy any of Mary’s Medicinals products, you can do a simple (but powerful) search in Nugg to find which local dispensaries are currently able to deliver these products to you. It’s impossible to compare. While patches and transdermal gels are a godsend for long trips and a perfect way to time-release your medication, you may miss the sensual experience of inhaling a thick cloud of smoke, or of biting into a delicious brownie. On the plus side, Mary’s products are delivered directly to the bloodstream avoiding first-pass metabolism by the liver and breakdown by stomach acids. This gives their products an effective dosing of approximately 10 fold over anything else on the market, according to the Mary’s Medicinals website anyways. Many of their patches contain THC which is also the primary active ingredient in cannabis. However, smoking cannabis high in THC results in a sudden “high” that wears off quickly, while Mary’s Patch is designed to deliver a slow and consistent long-term medicinal dosage. Their cannabinoid specific products, such as THCa and CBD, are non-psychotropic, so they are much less like smoking. Their list of ingredients, as displayed on the packaging, includes carefully extracted Cannabis oil, which is cannabinoid- and terpene-enriched. A proprietary carrier compound delivers the active medicine directly to the bloodstream for maximum efficiency and bioavailability. Plus, all of their patches are made with hypoallergenic silicone backer and are latex-free. However, a guy who claims to have helped develop the transdermal cannabis patch has been trolling (well, it depends how you see it) medical marijuana boards and offers a little shade. He says the Mary’s patch is not all-natural, and that it contains chemicals in both the patch and the adhesive. Furthermore, he reminds us that ALL transdermal patches come with risks. Remember that our skin is a fairly effective barrier, but it’s not 100% fool-proof. It’s been protecting our innards for hundreds of thousands of years, and it will never let stuff enter your body without a fight. In order for a transdermal job to do its job, it must include an agent that relaxes the skin to let the medication seep into your bloodstream. Unfortunately, in this relaxed state, the area of skin covered by the patch also lets you take in smog and other environmental toxins intravenously. Sounds scary, we know, but even the skeptical patch developer considers the patch and transdermal gel pen to be safe. Just be sure to clean the area with alcohol only – don’t use soap – and cover the dab of gel concentrate with a chemically-resistant material, like Teflon sheet. Mary’s Medicinals innovative topical and transdermal products have won many awards, including the Cannabis Business Awards 2014 Invention of the Year and Best New Product at the prestigious High Times Cannabis Cup. We couldn’t agree more – transdermal products with precise dosing and maximum effectiveness are here to stay. You can decide for yourself, because Mary’s Medicinals products are currently on the shelves of your favorite dispensary. Or you can simply visit Getnugg.com, the GrubHub of medical marijuana delivery services, and have Mary’s convenient patches, creams and powders at your door in about an hour. Nugg delivery is now available in over 60 California cities, and provides online research and thousands of products from local cannabis dispensaries, with 24/7 customer service and no cost to you. Register below for free home delivery. Transdermal ingestion of cannabinoids may not be everyone’s cup of tea, but in this instant-gratification world of potent concentrates and red-hot dab hits, Mary’s Medicinals’ transdermal marijuana patch is certainly a welcome relief. I have lived with chronic nerve pain for 8 yrs. Does this really work? Their products are growing in popularity and we’ve heard nothing but good things so we recommend trying them, particularly the patches. I’m a Canadian, can I order these products for delivery to Canada? We’re sorry to hear about your condition, Maggie. Currently Mary’s Medicinals’ mmj patches are only available in a handful of states, most of which are on the West Coast. But you can order Mary’s Nutritionals’ hemp based products (no THC or psychoactive effects), including patches, in all 50 states. I’m not sure if they’ll ship to Canada, but it couldn’t hurt to ask. FOR THE PATCH DO YOU HAVE TO HAVE A DR.’S SCRIPT? Sorry to hear that, Ruffier. As of now Mary’s Medicinals’ mmj patches are only available in a handful of states, most of which are on the West Coast. But their Mary’s Nutritionals’ hemp based products (no THC or psychoactive effects) include patches and are available across the U.S. It looks like you’re in France so I’m not sure if they’ll ship there, but you could ask.